Fast in three simple steps. Unlock your phone without voiding the warranty. How to unlock my Azumi phone with doctorSIM? Unlocking any Azumi phone with doctorSIM is a simple three-step process. First, complete the form with the information we need to unlock your phone. Then select your preferred secure payment method to complete your request. Finally, within a guaranteed period of time, we'll send you via e-mail an unlock code and step-by-step instructions on how to finalize the process. How long will it take to unlock an Azumi phone? The exact time it will take us to unlock your phone will depend on the device's network operator and the unlocking service selected. Once you have chosen the carrier to which your Azumi is locked, two different times will be displayed on the screen: Average and Guaranteed Delivery Time. However, we aim to unlock your phone as fast as possible and will even send the unlock code to you over the weekend if available beforehand. Where can I find the price for my Azumi unlock code? Similar to the time frame, the cost of your unlock code will appear on the screen the moment you select the phone's network carrier. Any current discount or promotion will also be indicated here. Will my unlocked Azumi work on any carrier in the world? Once unlocked by doctorSIM you'll be able to use your Azumi phone on any compatible GSM carrier in the world as long as it has not been blacklisted due to loss, theft or unpaid bill. Our unlock method via IMEI is legal and permanent which means you don't have to worry about future software updates. What does blacklisted due to loss, theft or unpaid bill mean? Occasionally, a network provider will place the IMEI number of a phone on a blacklist because it has been reported lost, stolen or because the owner has an outstanding bill. When this happens, the phone will almost certainly not work properly in the country of origin of the network carrier. It will, however, most likely work abroad. To check if any phone has been blacklisted, use our free IMEI phone check service which scans the databases of hundreds of network providers or by contacting the carrier to which your Azumi is locked. Can doctorSIM remove my Azumi phone from the blacklist? Unfortunately, no. Our unlocking services are for releasing phones from their network and cannot remove this additional security measure. Only the carrier that placed the phone on the blacklist can remove it. Once removed from the blacklist, you can unlock the phone with doctorSIM safely. What happens if you cannot unlock my Azumi cell phone? If all the information you send us on your Azumi is correct and we cannot unlock your cell phone, we will issue you a full refund. Just make sure the information you send us is correct because the unlocking process is fully automated and the unlock code delivered to you will be based on the details provided. Will I lose my warranty unlocking my Azumi phone with doctorSIM? No. Unlocking your phone with doctorSIM will not affect the Azumi's warranty. In fact, our method of unlocking phones via IMEI number is the method recommended by Azumi as well as by phone manufacturers and network carriers themselves. 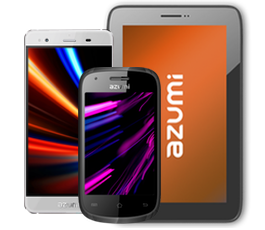 Our unlocking method maintains your Azumi's warranty. Carry on using your phone as normal during the unlocking process. Our unlocking services are available for all Azumi models. Excellent customer support available to assist you. Will not harm your cell phone.